This club-like program is designed especially for older adults, offering social interaction, cognitive stimulation, events and outings. Adult Day Services* provides relief to family members and allows the freedom to go to work, handle personal business or just relax while knowing your loved one is safe and well cared for. We are trained as leaders in dementia care, as recognized by the Alzheimer’s Association. Adult Day Services are available at Someren Glen in Centennial and Clermont Park in Denver. To see where these communities are located, visit our maps page. Creative Expression: Participation in art and music sparks imagination, allowing your loved one the opportunity to showcase talent and creativity. Learning & Exploration: Variety is the spice of life. Whether it’s learning how to use a computer or undertaking an educational project, your loved one has the potential to reach beyond the borders of the known to discover new abilities and interests. Good Health: Important aspects to maintaining quality of life are a healthy mind, body and spirit. We provide activities that stimulate the mind. Exercise classes, along with nutritious and delicious snacks and lunches, help keep your loved one invigorated. Individualized Staff Attention: Our program is small and intimate, allowing for more individualized attention. 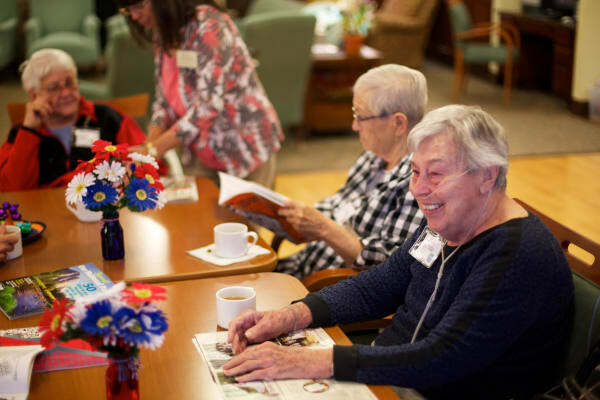 * Some people refer to what we offer as Adult Day Care, or Senior Day Care, but we offer far more than just care - you'll find a vibrant living environment! You may have visited Senior Day Care Centers, but our home-like settings are very warm, intimate and welcoming. I’d like to learn more about Adult Day Services.